10 Reasons Why I Still Love My E71 ! Hello all ! I hope you all are doing fine and still enjoying your E71 ! This time I am back again with some of my experiences with E71 and reasons why I still love my Nokia E71. I hope you all will like it and must be having some similar experience with it and had a good and happy time using this wonderful phone ever by Nokia. Well, I have owned 5-6 different models and atleast 4 of them were made by Nokia including one Nokia 5700 XM. Right now, I am just addicted to Nokia's user-interface which is said to be the most easiest user interface ever made by any mobile phone provider. I call that interface as a "Human touch". However, some of the nokia phones do have some software problems but they are to the less concern as that can be solved easily. Some of the Nokia phones have less RAM and because of that, they get hanged or restart sometimes or the phone would switch off during the phone call or some phones would operate slowly due to the same RAM issue. But the Nokia E71, which I purchased exactly 7 months ago has impressed me on all accounts. 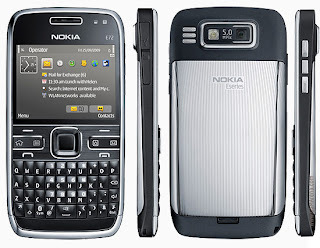 Let me list down and tell you the 10 reasons why even after using it for such a long time, I still love my Nokia E71 ! 3G : This phone has got 3G which some of the other phones might not be having. I have used Skype , watched Youtube videos and have checked mails and for me, It has worked very well. QWERTY keypad : This phone has a blackberry style QWERTY pad which is a great advantage. I use my twitter all the time so I think I have utilized all the keys several times. GPS : It has got the best GPS technology and in recent news, Nokia has given free maps navigation for this device. For more details, you can read this article. This navigation system has helped me several times in an unknown city. Memory : When I purchased this phone, I had 2GB in it and I felt no need of buying a higher memory card but still now I have got an 8Gb memory card for it with which I can store so many music and data in it. Longer Battery Life : This phone has got probably the biggest battery I have ever seen in any phone. But the main thing is that it provides a very good battery backup. I charge my phone once in 2 days even though I keep it connected to GPRS all the time. Comparing it to Nokia E72, which needs to be charged everyday! Its Fast : This phone has got more RAM than Nokia N97 ! You might have noticed this too but for me, this is the fastest Nokia phone I have used. I have run 19 application at once on this phone and checked its capability and it was up to the mark. Its Beautiful : Talking about its design, I just love it ! Its so sleek with its steel body and mine is a white one! Decent Camera : It has got 3.2M camera which is quite a cool one to click daylight pictures, though its night result is not so good but for a tip, Press "T" while clicking pictures to set auto-focus! Softwares : As you all know, It runs on s60 v3 platform, so the software support is very high. This has a firmware which is very easy to hack. you can check this article to hack your Nokia E71. By doing this, you can install any unsigned application which gives you certificate error. Bluetooth : As I mentioned above, This phone has got wifi, 3G and GPS, it has inbuilt powerful bluetooth. I have got Nokia BH-503 bluetooth headphone which I connect with it and it provides a great music experience. In short, E71 is a complete packaged phone which has got all business looks with great music experience and overall it is the best phone you should go for! What are your experiences with E71 ? Are you still loving this device ? Let me know your views By leaving a comment below ! I am Rahul Banker, blog at thecopypasteblog. To know more about me and Nokia E71, follow me on my twitter : Bankerrahul. Hey pals! Hope you all are doing fine. Well, I assume that you have already hacked your firmware by referring to my previous post on hacking E71 firmware and now I am giving an awesome article about how to change the fonts of your phone ! I assure you that you are going to love this post too just as you loved my previous post and I thank each and everyone of you. So, the application we are going to use is named : FontRouter. Without much delay, I explain you the procedure and as usual, I will try my level best to make it as easy as possible to understand. Admin note: Hack at your own risk. If something happens to your phone we are not liable. Things you will need : Your Firmware Hacked Nokia E71, Fontrouter, .ttf font file (must be a .ttf file) and that's it ! Download and install FontRouter and restart your phone once. Now download the font of your need. I personally like Pristina font (download here) very much as they are stylish and decent. Now here comes the main and a very important part. Connect your phone to PC in "Mass storage" mode and open your memore card folder. I assume that your memory card drive is assigned as E drive, you may change it according to yours. Goto E:\resource and check if you have got any folder named "FONTS". If not, create it. Copy and paste the fonts you downloaded or any of your choice in that folder. Once done, Restart your phone and see the magic !! For more fonts downloads for free, you may check this article. P.S. you must follow all the steps exactly as I mention here or I am not responsible for the result. Wanna know more about me ? Visit my own blog and follow me on twitter. Hello friends. I am Rahul Banker. A new author of e71fanatics. I am a chief editor at thecopypasteblog.com and i have been assigned as an author here by mike macias, the owner of this blog. So, today I am writing my first post here and I have got an amazing and a surprising article for you! Well, there are millions of smartphone users and almost all have a similar problem sometimes while installing any unsigned application and only few of them have successfully got a solution for it. Many of my own friends keep on asking about how I can install any application on my E71 without any errors and to be frank, I have no time to explain each and everyone personally about how to do that. So here I have decided to write a killer article that would give you a pleasant experience while using your phone and also while installing any application or game! I am going to teach you how to hack your Nokia E71 firmware after which you can install any unsigned application without any haze. Admin warning: Hack at your own risk. If something happens to your phone we are not liable. I know there are hundred of ways available over the internet with which you can do it but I am showing you the easiest way possible as far as I know and I will surely try to make it as simple as I can. Here is the list of things you will need : Your E71 (of course), Nokia PC suite, FreeSigner application, HelloOx2 unsigned and some patience, that's it! I am listing down the method so that it becomes more easier for you to follow. Goto OPDA and sign up for an account and login to it. It will give a success confirmation once done and you will have to check OPDA again after 5 hours to download your certificate and key. Now Download HelloOx2 application and save (don't install) in your phone. Now Download FreeSigner and install it to your phone. Now run FreeSigner and goto options > settings and map your certificate and key file there and leave all the other fields as it it. Now Press back and select Add Task and map your HelloOx2 file which you saved as per the point number 5 and select Self Sign Sis. Press option > Go! . After few seconds go to the place where you saved your HelloOx2 and install and run it. It will do the rest of the work and you're done! Now you may try installing any application or game which was giving you a certificate error previously and you will be happy to install it. Liked the post ?? Please leave a comment below and follow me on twitter. You have to love Google’s constant updates to their Maps software. They never seem to forget about Symbian S60 devices when many companies pretend Symbian doesn’t exist. The newest feature coming to Google Maps on the E71 and all other Nokia smartphones is voice search. This new feature combined with street view, synced favorites to your account, transit times/directions, and much more makes Google Maps one of the most useful applications available for your smartphone. Tell your phone where you want to go and you’ll get results. I’ve tested this new feature alot on my N97 and E71 and it’s amazing how accurate Google is at understanding your voice. And right now my voice is completely shot. I’m battling a cold so it’s raspy and horrible sounding. I’ve attended two LA Kings playoff games in the past five days, cheering wildly for the team. My voice is weak. Still, Google Maps had about a 90% accuracy rate in my tests. I even tried once with the windows down and radio on in the car. Granted the radio was not turned up loud but still there were outside noises and it didn’t have a problem. I even searched for addresses. Four digits and a weird street name, along with the city. Google Maps handled it well. It seems a few small things in the UI have also been updated to give it a much cleaner look. I love the way Google Maps now integrates with my Google account, showing my favorites both on the PC and phone. Search by voice lets you easily search for anything by simply speaking your search terms instead of typing them. Just open Google Maps, press your phone’s “call” button, and clearly speak your search term like “Park Plaza.” Search by voice works with all the kinds of searches Google Maps for mobile already supports, including places, addresses (1600 Amphitheatre Parkway), specific businesses (The French Laundry), or types of businesses (sushi restaurants new york). Go to m.google.com/maps from your phone’s browser to get the newest version. Let us know what you think and if you have similar results. There has been some big news for the Nokia E71 as of late. We recently told you about Ovi Maps adding free voice navigation for E71 users, and now we get another firmware update (if you're one of the lucky ones). This new firmware brings the E71 to version 410.21.010 with a few new functions and a handful of changes and improvements. Good times! Not to mention Amazon just dropped the price of the E71 White to $199.99 . Update: The deal is now over, back up to regular price. Not a bad deal if you don't feel like spending cash on the E72 ($339.99 ) and have been itching for the white E71 version. Personally I've never had my hands on the white E71 but I know a few people who absolutely adore it. Might be a good pickup if you can get some cash for your old E71 (maybe $100) and pick up a new white one with a renewed warranty. Back to the firmware update! Visit Daily Mobile for a list of E71 product codes that got the update. I can't get my Nokia E71 out of v20 firmware. It's still not finding any newer updates. I wonder how many of you are having this problem. If you are able to update let us knhow how you like the new firmware. And remember to backup your data! All I can say is that it's about time. Back in January it was announced that new Nokia smartphones would come with free voice navigation in the Ovi Maps application. The E71 was not on that list. The N97 and E72 was initially included, along with a few other devices. This pissed off a lot of E71 users because it is such a popular device. Just a few minutes ago I was checking my rss feeds and came across this post by the official Ovi blog, announcing that Ovi Maps with free navigation is now available for the Nokia E71 and E66. This is huge news for readers of this blog. 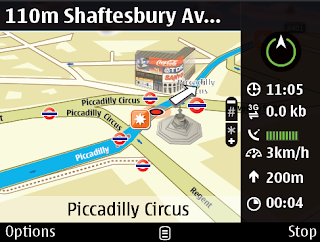 You now can rely on Ovi Maps for turn by turn navigation. Prior to this I would only use Google Maps on my E71, but that didn't include voice navigation like Ovi Maps does. ...After listening to your overwhelmingly positive feedback and feeling your love for your favourite mobile phone, we have now created a custom version that works on Nokia E71 and Nokia E66. However, because of technical constraints, it isn’t possible to offer premium content such as Michelin and Lonely Planet guides on these devices. and drive navigation. But we are already feeling your excitement: grab your Ovi Maps with free navigation now at nokia.com/maps! of Ovi Maps or Nokia Maps that is installed on the device. In usage there are occasions, as with earlier version on the Nokia E71, when Ovi Maps can feel somewhat sluggish compared to more recent devices. However the streamlined user interface is a significant improvement and the new version is a recommended install for all E71 and E66 users, not least for the availability of free car and pedestrian navigation. For those of you who don't know much about Ovi Maps or haven't tried it I would tell you to give it a shot. I compared it to my sister's TomTom and I prefer Ovi Maps a little more. The directions are more clear and you have more views and layouts to choose from. Don't forget that you can load up maps to your memory card when the phone is connected to a computer using Nokia Maps Loader. I highly recommend this to save time and data usage. Now the E71 won't have to connect to the web everytime you open Ovi Maps. Visit nokia.com/maps to download Ovi Maps for the Nokia E71. Be sure to let us know your thoughts on this and your experience with this new version. Handy Weather For E71 & Symbian Smartphones 50% Off: Today Only! One of the best weather solutions for the Nokia E71 is Handy Weather, although it normally is a little pricey. But some people live in harsh and ever-changing weather conditions and absolutely need a reliable weather application for their smartphone. Today only Handy Weather is on sale - 50% off bringing it to $12.47. Weather screensaver – to see at a glance weather conditions for next 2 days. 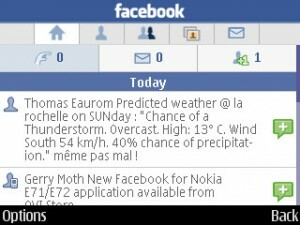 Download Handy Weather For E71 today! Hello everyone. I have a review of the Nokia E72 lined up to be published, it will be mostly pictures and small details. There aren't many huge differences between the E71 and E72, but I'll just cover the most important ones. Before I get that review up I'd like to have an open forum type post, right here in the comments section of this article. I can respond to each one of your questions, hopefully my answers will help to make your decision if you've been thinking about buying the Nokia E72. Now is a really good time actually since Amazon has the E72 for $339.99 right now. You might have questions about email, maps (free voice navigation), the keyboard, applications, speed, music experience, whatever. Just scroll down to the comments section below and fire away! Hey gals & gals! The official Skype application is finally out for the Nokia E71. Good thing is it works for the E63 and E72 as well. Not sure about the E71x, however. Something tells me that AT&T probably disabled this from working. All of the main features needed are included in the Skype application for Symbian. Contacts list (with thumbnails), chat, and talk are supposed to work without any problems. How awesome would it be if video chat was included? Ruben from Open-Voip.com sent me a tweet today letting me know of his full review of Skype of the E71. He provides an overview of all the features along with screenshots. Be sure to check it out before trying it yourself. 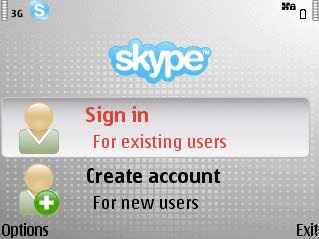 Go to http://skype.com/m from your mobile browser to try Skype on your Nokia E71 or E72 smartphone. Be sure to let us know your thoughts and what can be improved! Hi all! Sorry for the lack of forums and articles here at the coolest place for E71 owners to hang out. I've had a lot going on the past few months including a new job and my wedding to plan. Things are slowing down a bit finally so I'll be able to put more attention back into this site. I had to change servers recently which is why the forums are down. All the content and users in the database will still be intact, although some of you might have to re-upload your avatar. Look for the forums to be back up this weekend - I'll give you guys a heads up right here and at our @e71fanatics twitter account. Stay tuned for lots of coverage on the Nokia E72. My fiance and I have been using the E72 for the past month or so. She absolutely loves it, even more than I do. I'll have lots of photos to show you and will be answering any questions that you guys and gals might have. It’s been awhile since I mentioned the Google Maps application that I use so often on my E71. Since that time it’s received some huge updates that I’ve been meaning to share with you E71 Fanatics! Almost on a daily basis I open it up to search for a gas station, local pub, bank, or a place to buy flowers. I get details I need such as the phone number, directions, reviews, etc. It’s really astonishing. I even save my favorite places for later viewing and fast access for directions. I don’t only use Google Maps on my smartphone. I also use the powerful webpage on my computer to find what I'm looking for. What if you can sync those places, directions, maps, etc. between computer and E71? Well if you haven’t updated to the latest version in awhile, then you’re really missing out. Awesome right? That’s not it. Check out the new “layers” feature that I mentioned in the title. If you haven’t already tried out Google Maps you need to! I hardly ever fire up Ovi Maps anymore. Do you love your E71 so much that not even the mighty Nokia N900 tempts you to upgrade? You're not the only one. Many other E71 Fanatics don't see a need to dish out more money for a smartphone. But there is still that part of you that wants to keep up with the latest technology. It's the current trend & a standard for newer smartphones to include a large touchscreen display with great multimedia functionality. The iPhone (and iPod Touch) is very tempting with all of the cool apps that you can download and the eye candy, but for most E71 users the iPhone is majorly lacking and can't be used as a main device. The N97 is another option but not at $500. What is an E71 user to do who needs more options? That's right. 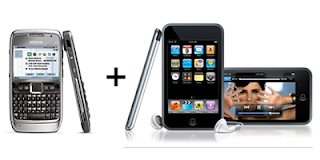 You can turn your E71 & data connection into a walking WiFi hotspot, sharing the web with an iPod Touch or other multimedia device (like your laptop). Think of it like your internet router at home. The E71 can be the same thing. This can be done thanks to a Symbian application called JoikuSpot. JoikuSpot is a mobile software solution that turns Nokia Smartphones to WLAN HotSpots. 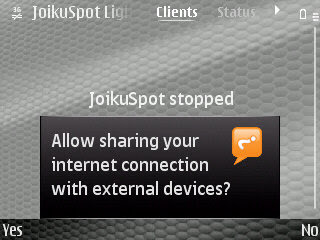 JoikuSpot software is installed directly to the phone. When switched on, laptops and iPods can establish instant and fast wireless internet connection via smartphone's JoikuSpot access point using phone's own 3G internet connection. There are two versions of JoikuSpot. One is free and the Premium is $12.99. I recommend the commercial version if you plan on using it everyday and need something reliable. I've tested JoikuSpot Premium with my brothers Apple iTouch and it works perfectly. I have full access to all the iPhone applications that need a data connection and the web browser. Of course it would be smart to have an unlimited data connection on your E71 to avoid high charges. Most of you already have an iPod Touch. 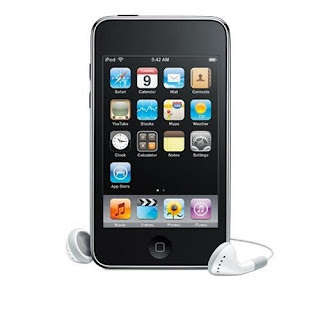 If you don't I came across this 1-day only deal at Amazon for the Apple iPod touch 8 GB (2nd Generation) . It's on sale for $158.99 - down from $199.99. If you miss this deal Amazon always has decent prices on their entire iPod touch lineup. Do any of you have this combination and use it on a daily basis? With the E71's great battery life and a spare charger this can really be a powerful duo. Best of both worlds. Over the Thankgiving Day holiday weekend Nokia decided to release the new E71 firmware, version 400.21.013. The timing makes perfect sense because Thanksgiving is a North American holiday and the firmware wasn't released for the E71-2 which is the North American version. At least it's not showing up on my Nokia Software Updater screen. Maybe some of you are having better luck. Congrats to the rest of the E71 Fanatics around the world who are able to update. • Robustness and functionality improvements in email items. As you can see it's mostly fixes and improvements. It's nice to see that the latest version of Nokia Messaging was included in this firmware. Is this still a seperate application or is it now embedded into the Messaging app? NO! This update does not add Feature Pack 2 as found on the Nokia E72 . As always - be sure to backup your data before the update. You will lose all of your applications and settings so keep that in mind and give yourself some time to re-install all of your favorite applications & themes. Have you updated your E71 with the latest firmware? Let us know how it goes and what differences you see. Well it's finally here - the official Facebook application for the Nokia E71 (and E72). I'm assuming this app will work on all S60v3 devices including the N86. For some reason Nokia decided NOT to announce this news, even though their loyal E71 users have been waiting for this since it was preinstalled on the N97 months ago. check messages and lookup phone numbers when you need them anytime and anywhere. I haven't got a chance to test out the application yet because my SIM card is currently in the N97. I'm assuming it works just like the version I'm using right now. Thanks to CJ and one of his readers for the great find! Be sure to check out the ZOMG its CJ blog for tons of Nokia news and tips. Find it in the Ovi Store or click here for the direct link. I'd love to hear your thoughts and opinions on this app since I'm not able to test it out right now.